If you ever thought about killing your neighbor then this is the book for you. Of course, you probably think of killing people around you metaphorically; you toy with the idea and you have to admit that we all have dirty thoughts, of the kind that we wouldn’t dare to share. I’ll tell you one of mine though: I love taking naps and they are sacred to me. Therefore, I hate when one of those youngsters with their tuned cars drive through the front of my house with their loud and stupid rave music, with utter disregard to the peace and tranquility of the neighborhood. They honestly get on my nerves and many times I toyed with the idea of throwing a stone or some tool at their windshield. I’m sure (at least some of) you agree with the sentiment. Certainly, there’s a difference between thinking and taking action, and I know very well that I would never do such a thing (yet?). In High Rise though, basically all those concessions and codes disappear and people allow their most private thoughts and desires to become actions, with shocking results. 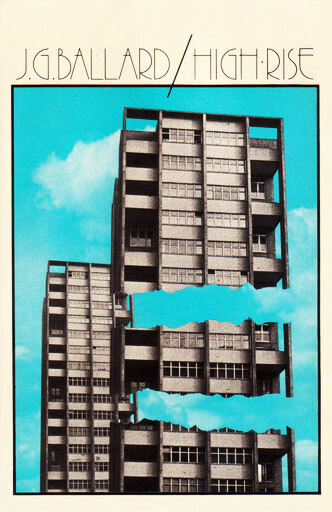 I said before that Ballard is bleak and the very first sentence of the book exemplifies this very well: “Later, as he sat on his balcony eating the dog, Dr Robert Laing reflected on the unusual events that had taken place within this huge apartment building during the previous three months.” Yes, in High Rise eating dogs eventually becomes as common as eating burgers. It’s seriously disturbing to read about these people retreating to a more primitive kind of existence and, worst of all, recognizing actual traits of our modern society in them (sans the part about eating dogs perhaps). It’s grossly overblown by the Ballard’s pen but it somehow represents you and me. All of us. The story in High Rise revolves around this huge skyscraper and the community that lives within. This complex is very exclusive and the majority of the tenants are wealthy and well-established professionals. Other than leaving to work, everybody can practically live inside the construction: there’s a supermarket, schools, swimming pools and plenty of more things to sustain a leisure lifestyle. Even so, the building is divided into sections and, as you go up, the more exclusive the locations get. This division obviously represents the classic groups of society: lower, middle and upper class. Little by little, tensions start to arise as some tenants start to claim elevators as their own, others disallow access to the pools in their levels, and other minor skirmishes arise that soon degenerate into a fierce battle. Then the first death occurs and the drop into chaos is inevitable. Everybody feels as if the skyscraper was their hunting grounds, they lose sense of time, stop going to work, even fear to go outside, to the real world… Clans are formed and eventually people start fighting for the most basic of needs: food and survival. I know, you’re probably thinking to yourself that this is a bit too much and my brief description probably makes it sound really exaggerated. But with the sparse yet stunning prose of Ballard, the slow but steady descent into madness, his heartless characters purely driven by instinct, you can’t help feeling that, under some circumstances, this could very well happen. Just go outside and take a short ride in subway, or watch a football game, or pay a visit to a software company; you’ll see that we’re not that far from starting to kill each other if it wasn’t for certain codes. 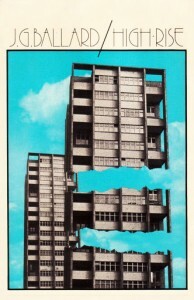 Things might have been different back in 1975 when High Rise was written but, just like its sick little brother Crash, it’s a prophetic book, depicting a society just like ours today. It might be Ballard’s most iconic book in fact because it predates his later body of work that deals with similar themes, such as Cocaine Nights, by a couple of decades. This shocking piece really makes us feel like we’re going backwards, in a downward spiral into our most inner instincts and desires, our primitive selves. He was obsessed with this theme which reoccurs throughout most of his work but, if you think about it, perhaps Ballard knew the key and he was warning us. We can only hope that he wasn’t a real prophet. I’m glad you like this idea, and I hope to comment on many more special books as time goes by!